Investment casting can make use of most metals, most commonly using bronze alloys, stainless steel, and tool steel. This process is beneficial for casting metals with high melting temperatures that can not be molded in plaster or metal. Parts that are typically made by investment casting include those with complex geometry such as turbine blades or firearm components. High temperature applications are also common, which includes parts for the automotive, aircraft, and military industries. The process is generally used for small castings, but has produced complete aircraft door frames, steel castings of up to 300 kg and aluminium castings of up to 30 kg. It is generally more expensive per unit than die casting or sand casting but with lower equipment cost. It can produce complicated shapes that would be difficult or impossible with die casting, yet like that process, it requires little surface finishing and only minor machining. Investment casting is used in the aerospace and power generation industries to produce turbine blades with complex shapes or cooling systems. Blades produced by investment casting can include single-crystal (SX), directionally solidified (DS), or conventional equiaxed blades. It is also widely used by firearms manufacturers to fabricate firearm receivers, triggers, hammers, and other precision parts at low cost. Other industries that use standard investment-cast parts include military, medical, commercial and automotive. Investment casting offers high production rates, particularly for small or highly complex components, and extremely good surface finish (CT4-CT6 class accuracy and Ra1.6-6.3 surface roughness) with very little machining. The drawbacks include the specialized equipment, costly refractories and binders, many operations to make a mold, and occasional minute defects. Alloy Steel: ASTM 430; ASTM410; ASTM 416, ect. Carbon Steel: WCB, AISI1020; AISI1045; S355J2G3, S235JR, ect. 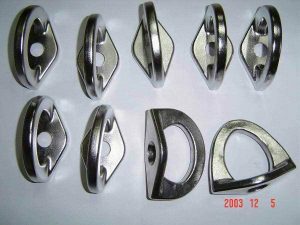 Stainless Steel: SS304; SS316; SS316L;17-4 PH; ect. Copper: C21000; C26800; C27000; C27200, ect. Turbine blades, armament parts, pipe fittings, lock parts, handtools, agriculture parts,marine parts,medical parts,hardware,automobile parts,ect.